The U.S. Environmental Protection Agency convened the ENERGY STAR Commercial Buildings Partner Meeting on Tuesday, October 24th and Wednesday, October 25th at the Sheraton Grand Chicago in conjunction with the ENERGY STAR Products Partner Meeting and ENERGY STAR Certified Homes Stakeholder Meetings. Thank you to everyone that attended and contributed to the success of the meetings. Join EPA to hear insights from 20 years of programmatic energy management experience in the commercial marketplace, including a sneak peek at trends in ENERGY STAR Portfolio Manager, the nation’s largest database of commercial buildings benchmarking energy and water use. You’ll also have the opportunity to give feedback on future program priorities, plus learn about new tools and updates available from the program. Advances in metering, analytics, and smart building technology offer new pathways for capturing energy savings, but only if energy managers understand how to deploy them effectively. While many of us are racing to keep up with the pace of technological advances, this session will preview what’s on the horizon and outline steps energy managers can take to prepare for a smart, connected future. These leading partners have leveraged the ENERGY STAR brand to achieve even greater success. Explore how you can use ENERGY STAR in new ways to increase profitability, engage stakeholders, and enhance market presence. Advances in lighting and control strategies have opened new opportunities to deploy lighting that is remarkably versatile and efficient. Learn how to make the most of lighting opportunities to not only save energy, but to optimize systems for the comfort and benefit of occupants while adding significant value. Leading ENERGY STAR partners have demonstrated that energy, water, and waste competitions are an effective way to build momentum and support for efficiency efforts and engage tenants and occupants. Find out practical tips and considerations for running your own competition from organizations that are leveraging these campaigns to raise awareness and drive deeper savings. EPA provides more than 500 items in the ENERGY STAR tools and resources library based on the proven energy management principles of successful ENERGY STAR partners. Find out what resources and recognition opportunities you’ve been missing during this lightning round session. During this roundtable discussion, you’ll hear experts from across diverse industries explore how to evaluate and capture the financial value of energy efficiency and sustainability programs. In August 2018, EPA will update the models that power 1-100 ENERGY STAR scores with new data, based on the latest Commercial Building Energy Consumption Survey (CBECS) from the U.S. Energy Information Administration. Join this interactive session to hear about EPA’s methodology and schedule for updating 1-100 ENERGY STAR scores, discuss considerations for building owners and managers, and learn what to expect when new scores are released. Electric vehicle (EV) charging stations are a standard feature at green, sustainable buildings due to progressive workplace policies and growing demand from employees and tenants. This session will provide a high-level overview of the EV charger market and will provide examples of best practices to consider for commercial installations. The people who work in your office building, retail store, warehouse, or other commercial building can make or break your efficiency strategy – after all, they often consume most of the energy. How do you engage your tenants and occupants to start saving energy? Learn innovative strategies and proven approaches to effectively drive savings in tenant spaces and get occupants energized about efficiency. A strong procurement policy is just the first step to ensuring your organization purchases quality energy-efficient commercial products. Learn about all the products you may not have known are ENERGY STAR certified, as well as the tools EPA provides to help you make the best purchasing decisions, from data center and commercial food service equipment to standard office equipment. Sustainable materials management (SMM) offers a significant opportunity for decreasing greenhouse gas emissions and, increasingly, to realize economic benefits. Hear about EPA’s SMM initiatives and how a commercial property owner and a sustainability service provider are identifying and overcoming challenges associated with managing materials to reduce waste and drive business value. With rising costs of water and wastewater services, businesses are becoming increasingly aware of the need to manage and use water more efficiently to reduce operating costs; energy needed to heat, store, and deliver water; and the risk of water shortages. Join this session to hear best practices for understanding your water use and establishing an effective water management program. 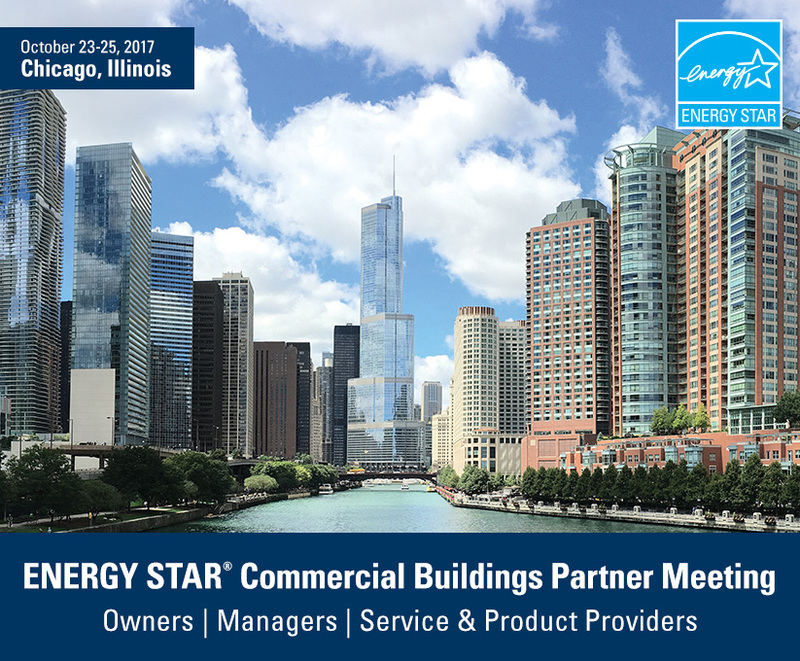 Dozens of energy efficiency experts from across the nation presented their lessons learned and proven practices during the ENERGY STAR Commercial Buildings Partner Meeting. Read speaker bios and organizational accomplishments (PDF, 949 KB) to learn more.